Brett Kavanaugh started his new job as a Supreme Court Justice today. 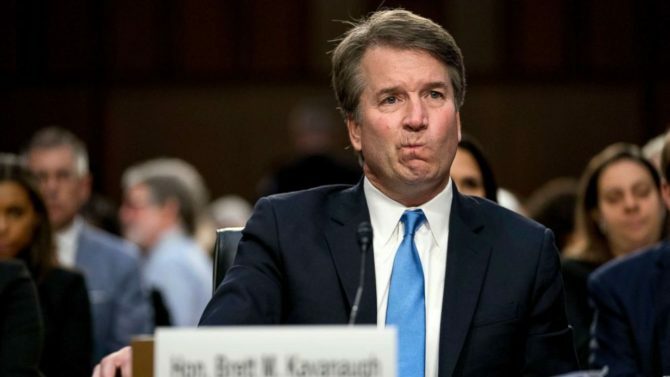 The 53-year-old beer-loving frat boy took the bench for his first arguments this morning after being narrowly confirmed by the Senate over the weekend. He was talking, of course, about the series of sexual assault allegations lodged against Kavanaugh in recent weeks. Kavanaugh’s appointment is not what Democrats wanted. It’s also not what many Americans wanted. But it’s what happened. Congratulations to the Supreme Court Justice Brett Kavanaugh. ????????????. Follow us @america.first.official . . #redwave #conservatives #republicans #trumptrain #trumppence #trump2020 #maga #godblesscalifornia #walkaway #votegop #trumpsupporters #deplorables #brettkavanaugh #confirmkavanaugh #walkway #keepamericagreat #constitution #supremecourtjustice #wethepeople #potus #trump?? We now return to our regularly schedule mayhem??? I am SO FLOCKING HAPPY KAVANAGH IS NOW AN ASSOCIATE JUSTICE ON SCOTUS!! Yup the backups could be much worse than kavanaugh. I am well pleased he was chosen. I’m open minded enough to be able to laugh at these cartoons, but I can also see the liberal bias of Queerty. They wanted to offend any of us who are conservative leaning. That’s the one thing that really bothers me about this web site. They think that one size fits all and that 100% of us should be flaming liberal Democrats. Curious about why you did not like Amy Barrett. I read her bio. All I could see that was ‘contestable’ is that she is very anti-abortion and said she would not sign off on the death penalty if she was a judge for a death penalty case..
@Josh447 Then who the heck are the backups? Lord Voldemort and Pennywise the Clown? @Mick406 I myself am a moderate but just as you don’t understand the “flaming liberals”, its hard for me to understand gay conservatives. What is it about him that makes you so “well pleased”? Especially since we were never told in any definitive way that he was innocent of horrific crimes against women? But even heartlessly putting that aside, what pleasure could any gay man take from having one more judge on the SCOTUS that would gladly strip us of our recently gained rights? Can you break it down for me, politely? I am trying to understand, here why ANY LGBT person should be “well pleased” about this. Gay conservatives never unclench their assholes. You must be anti-gay and anti-logic? I have never been deprived of any rights, and I have never been verbally or physically attacked. I also don’t go out waving flags and getting up in people’s faces. The way you are treated is the way most people will treat you back. As for Trump, Kavanaugh, and the conservatives . . . well, I just have faith they won’t change laws or make laws that will stomp on gay rights. Those issues have come a long way and any politician who would make any drastic law changes would suffer the consequences. I just don’t see the evil in them that most on this forum do. Don’t waste your time responding because I’m going to have to kill off this page on my laptop. For some reason, Queerty pages slow my computer down to a crawl or a complete dead stop. Wish I could stay to do “polite’ banter”, but I’ve got work to do. Thank you for your previous reply. Amy Coney Barrett is nothing short of a cultist, and you three Trumpkins should be ashamed of yourselves for supporting the Republican party. Apparently you place the lowest priority on your own happiness and freedoms, and that’s just plain sad. While I’m a definite independent I’m not happy with any conservative judge being appointed to the scotus. The republicans have been trying to stack a conservative Supreme Court since Bork was rejected. The republicans have been trying and now succeeded at making America a theocracy and the most conservative country on the planet. I’m sick to my stomach with Kavanaugh being confirmed. We gays can now look forward to many years of condemnation and harassment thanks to the republicans. Don’t be surprised when it’s illegal, again, to be gay and no more marriage equality, because that’s what the radical right and anti gay organizations are pushing for and with trump they’ll get it. These memes would be great if they were funny. They’re too bland. Sheesh. I didn’t realize there were so many self-loathing homocons .